Silver Coast was founded in 2010 and since that time the objective of the surf school has never changed. The cornerstone of our philosophy is to provide the best quality of the surf lessons powered by truly professional surf instructors and up to date gear. We are specifically focused on doing our best for you to receive the happiest experience of learning process. We like to be different in details starting from the small but very important things as washing the wetsuit with an eco labeled product before giving it to you and finishing separating the group by sub levels and choosing the best surf spot for the moment to go. We are very proud of our reputation and our goal is to have you back in our school again and again till you will reach the point of confidence based on your raised surf skills that will allow you to go by your own. Gonçalo is a head coach and one of the managers of Silver Coast. He realized that surfing is his biggest passion here, in Peniche, when he was 18 and he hasn’t stopped searching for perfect waves ever since. 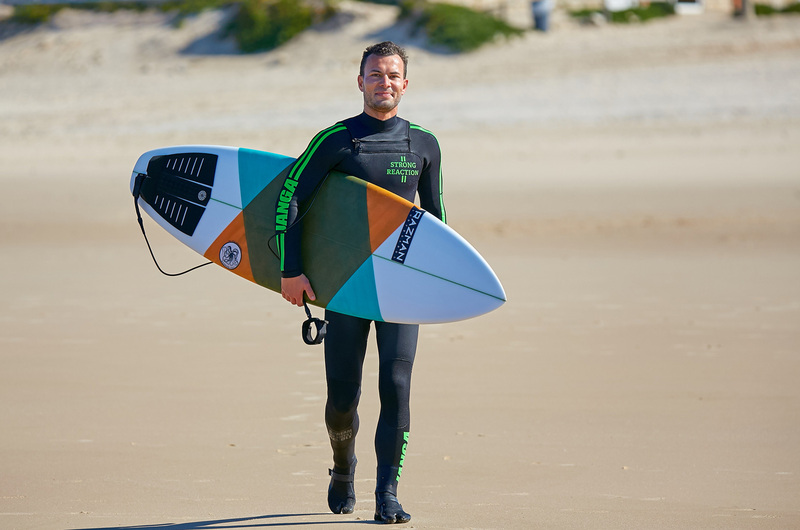 Later on, in 2006, he became a professional surf coach certified by the Portuguese Surfing Federation. 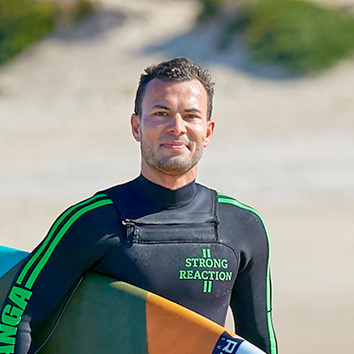 Gonçalo dedicated his life to teaching surfing forever after. He appreciates all manner of student: from those who has never tried surfing before to ones looking to improve their surfing technique. 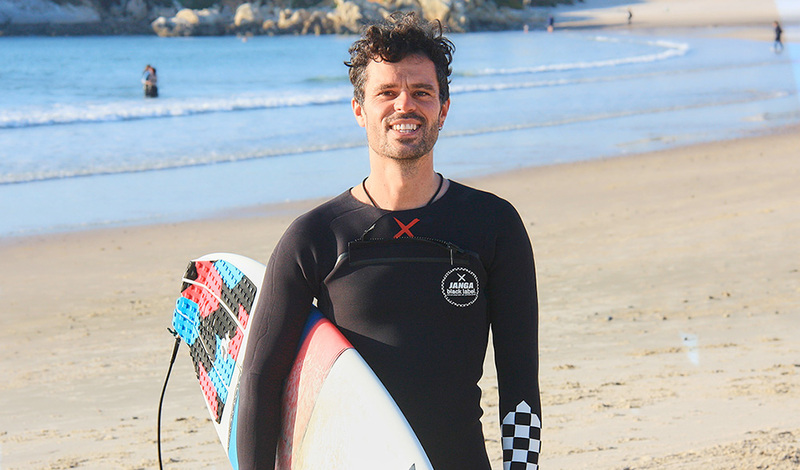 His main focus is to give a once-in-a-lifetime experience of surfing to every student. 100% surfer, Paulo is a real surfing nut. He’d love to tell you about serious stuff like rip currents, and then follow that with a bad pun. Paulo's won state and national sailing and windsurfing titles, he surfs almost everyday and has been doing an excellent job as a professional surf instructor since 2011. Paulo is our best in making you laugh and catch the waves of your life. Very patient and methodical, Paulo loves it when you ace your best wipeouts. 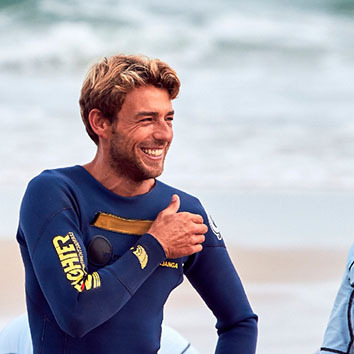 He is always in an amazing mood and makes sure everyone has an epic experience while surfing. André is Gonçalo’s little brother. He has a degree in Skateboarding so he’s killing it in all kinds of waves, whether it be ocean or concrete. He even performed in some national skateboarding competitions! Only at the age of 13, after his big bro showed him how to catch his first wave, he realized surfing is for life. 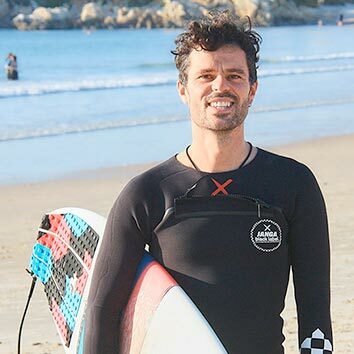 André wanted to share his love for surfing, so he started teaching as a hobby in 2007 and two years later he decided to become a professional surf coach. Rain or shine, he’s out there having a blast sharing his knowledge, experience and passion for surfing to everyone who wants to learn to surf. But beware: after a few lessons with André, you get ridiculously addicted to surfing! Rui is our youngest teacher and one of the best surfers in the house. Native to Peniche he is the most local of our instructors and forever attached to his native waters. All smiles, always friendly, easy going with good vibes Rui earned himself a “Baby Roo” nickname and a reputation of an experienced and caring surf instructor. Even though he’d learned to surf as a kid, surfing became his passion only when he turned 16. After that, in 2014, he started teaching and has been enjoying sharing the stoke with all clients ever since. Rui can teach you everything you need to know whether you want to simply give it a try or are looking to commit to being a PRO. His favorite surf is a late one, after his studies, with 4-5 foot perfection, gentle offshore and no one in the water. Marina was introduced to surfing right here in Silver Coast in October of 2013, and has been in love with the sport and place ever since. The best advice she has ever got was “Don’t let go of your board”, so she never did! She oozes expertise and encouragement, and seems most at home, expertly analyzing wave conditions on top of the cliffs, or having fun catching waves in her beloved pink wetsuit. Marina’s favorite thing about teaching is getting new students who have never surfed before and seeing them fall in love with the sport. When we find out where she gets all her energy, we're going to bottle it, and sell it for the big bucks! Another essential part of the Silver Coast crew, Irina answers your questions, books your holidays and helps you out with whatever you need: lesson info, transfer hire, surf reports. She is mission control behind the scenes here and works hard during the winter to get things pumping for the summer! She had her first ever surf lesson with the team at Silver Coast back in 2012 and is now hooked for life. She likes dawn because nothing beats being in the ocean for the sunrise. Her bravest moment in life was finding what would make her truly happy and than making the changes to do it. André is one of the best surf photographers ever and he constantly keeps improving his skills and updating the gear. If he won’t capture you surfing your first wave at our class don’t worry - he’ll photoshop you there. Just kidding - André always takes tons of cool pictures of our students in the water so you will have a lot to look back on your adventure and share with your friends on Facebook and Instagram. Also André is a professional web designer and a social media manager. And of course he loves to get barrelled on a good day with his friends too. Anatoly is one of the managers of Silver Coast doing his best organising the school life. He grew up in Moscow, graduated as a lawyer but shortly thereafter, in 2012, he changed his life moving to Portugal. The ever changing nature of the ocean made him fall in love with surfing. So choosing between skyscrapers and seascapes he followed his feelings and stayed on the coastline. If the new swell is coming it’s a call for Toly - he loves steep drops of uncrowded peaks and a state of mind achieved after a great surf session.